After a successful climb of the Grand Wall with Michal Rozworski (my summer goal), Michal and I decided we needed to test our rock prowessness on something a bit bigger and in the Alpine. After throwing around a few ideas, we settled on what Alpine Select describes as, “one of the best hard rock climbs in the guide:” Springbok Arete on Les Cornes (5.10c, 16 pitches, TD+). Two days later we were barrelling up the 25Km logging road in my civic hatchback into the Anderson River Range. 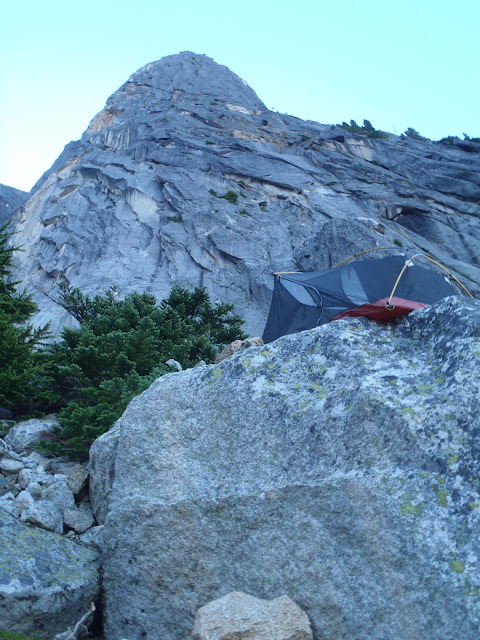 Recent reports of a total bushwhack approach were accurate, but after a mere 3 hours were at the base of the climb where we were able to pitch our tent on a nice flat rock. Our bivy at the base of the route. We started our climb the next morning with a short rappel into a snow moat to the bottom of the first pitch. We were warned of the poor quality of rock on the first few pitches, but were unprepared for what we found. Michal slowly grovelled up the first corner while sending down bucket loads of kitty litter the entire way. While belaying in the shade at 6AM, I noticed how warm it was and wondered if the 4 litres of water we packed were enough. Our route was south facing and we would be in the sun the entire way. I lead the second pitch up 5.9 layback flakes expecting the worst, but the rock was fortunately much more sound. A third pitch of poor rock lead to a long ramp system of low 5th which we simul-climbed to save time. This brought us to the bottom of the 6th pitch in the guidebook and the start of excellent climbing and excellent rock. Rappelling into the base of the climb with Steinbok in the background. Michal headed up a stiff 5.9 corner and stretched the rope into the next horizontal off width to the base of the start of the headwall pitches. Here, the angle kicks back and the climbing stiffens. The guidebook warns of difficult retreat once established on the upper section of the climb, so we double checked our water supply and contemplated the heat. It wasn’t going to be pretty, but we decided to push upwards. The route through the upper section of Les Cornes. The exposure was huge and the orange rock above us was intimidating. The next pitch started up finger cracks, to vertical off-width, to overhanging fist crack and finally up a steep juggy face. I started up wondering how far I would make it. The finger cracks went smoothly to the base of the off-width where I slid my #5 camalot as high as I could push it. I made several feeble attempts at progress before committing and thrutching my way upwards. After pulling through the overhanging fist crack I found the most awkward rest possible. Michal asked me if I was knee barring and I replied that I wish I was. From here, I quickly climbed the juggy crack to a nice ledge and let out a good scream of relief. Even more impressively, Michal was able to second up the pitch with our massive and heavy backpack. We both agreed later that seconding was actually harder than leading most of the pitches. Michal following an intimidating pitch through the orange headwall. Michal lead up the next 5.10 corner and linked it into what is described by others as the most improbable 5.8 traverse across flakes under an overhanging face to a two tree ledge. This had the first shade we had seen so far and it was much appreciated as the crux pitch was next. We quickly re-racked and I headed up the left facing corner with finger locks and stemming. I reached a fixed nut that I had read about just below the crux, but it pulled out of the rock when I clipped it, so then I shoved it back in the crack and re-fixed it by taking a miserable fall onto it. The crux of the pitch apparently requires you to be 7 feet tall so that you can reach the next finger lock, so I french freed this section and continued up the rock. Following the improbable 5.8 traverse. The next belay was situated in the middle of a large slab that felt like searing hot pavement and was by far the worst in terms of comfort. I begged Michal over our radios to move quickly, but we were both feeling the ill effects of the heat and inadequate amount of water. As Michal lead the next pitch, I curled up into a small ball and withered away under the oppressing sun. Michal’s hands and feet were starting to numb, slowing him further and extending my stay at the miserable belay. Fortunately, the next belay was again shaded and I whooped and hollered for joy as I slipped into its relative coolness. I wished I could have stayed there for more than a few minutes, but we needed to keep moving. 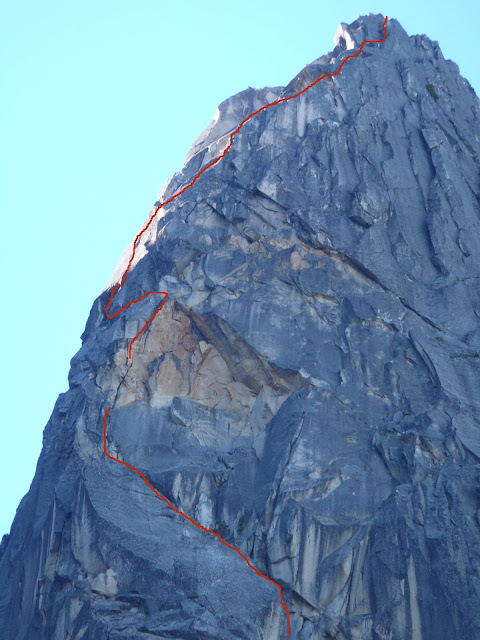 We were close to the top and Michal asked me to continue up if at all possible and link together the last pitches. I stepped around one corner and up more steep corners, delighted to discover that they too were shaded. I climbed as quickly as possible, stopping occasionally to place protection, and stretched our ropes to the top, belaying just below to stay in the shade. Michal finishing up the last pitch before the summit. We stayed roped up for the scramble over the summit and started simul-down-climbing the “au cheval” ridge that led us to the first rappel. I clipped myself to the anchor and started belaying Michal towards me. Just as Michal was climbing down the last ledge, he tripped and started tumbling down the slab towards the edge. I reeled back on the ropes in horror as I tried to stop his fall, but I was pulled off my footing and flat onto my back as Michal went head first out of sight. Fortunately, the ratty old rap tat I was anchored to held strong and when we both came to a stop, I could see Michal’s feet flailing just below the ledge. Michal’s first response was to swear profusely about how he always ended up bloody when alpine climbing. He then prussiked back up the rope and we began our rappels into the descent couloir. The "gut churning" downhill "au cheval"
After just two rappels and a short down climb, we found some ice cold meltwater in the gully that was more precious than anything in the world at the time. We took a quick break to refuel and re-hydrate and then continued down. After several more rappels, darkness fell, but our spirits were high. 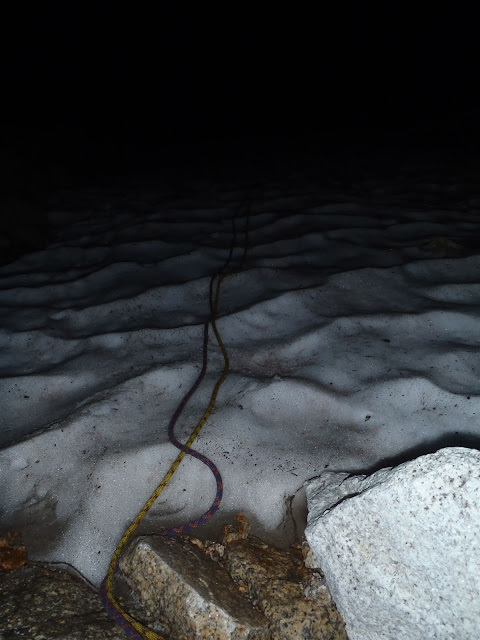 We made our two last rappels down snow in which we dug bollards using our nut tools. 17 hours after the start of our climb, we were back at camp enjoying a quick snack before calling it quits. We found a different route back to our car the next morning, but it traded shorter bushwhacking for denser bushwhacking. 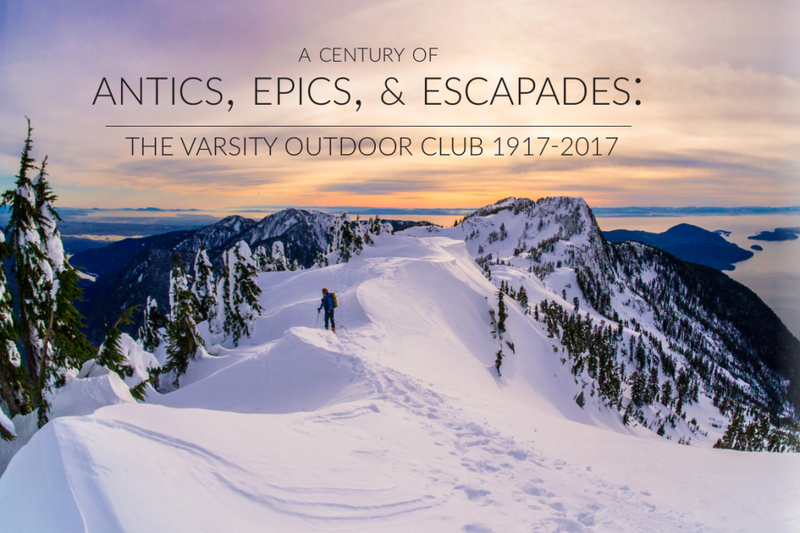 This entry was posted in Climb, Trip Reports and tagged Alpine Climbing, Climb, climbing, Face, fall, leading, ridge, scramble, Snow, summer, traverse. Bookmark the permalink. Very impressive and glad the ‘ratty old rap tat’ held well!